The HP T1700 Printer delivers high performance on even very complex files, with its Adobe PDF driver, and can lift CAD, GIS colour reproduction to another level, to enhance and improve your business output. Security is to the fore in this model, and protection for prints and data from unauthorised access is ensured with HP Secure Boot, an encrypted hard disk and more. Authentication solutions on offer include PIN printing, card readers and HP JetAdvantage Security Manager. You can also manage your printing fleet remotely with HP Web Jetadmin. 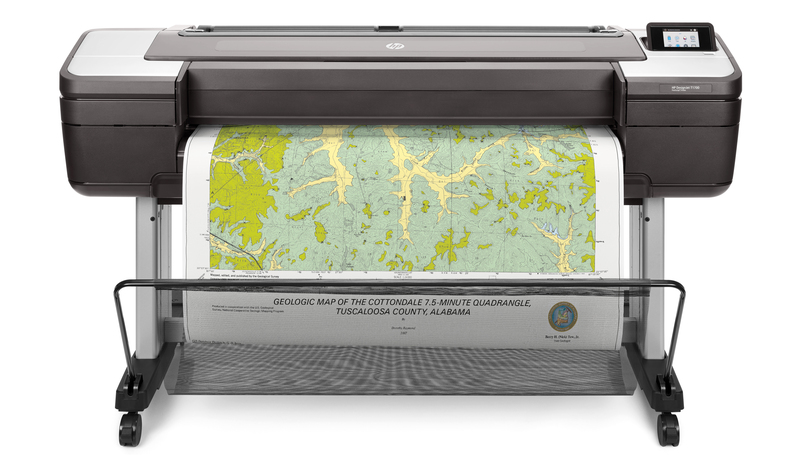 The printer provides improved colour quality and accuracy, which enables more precise maps and renderings, so that GIS workgroups can make better, cost-effective decisions. This HP DesignJet T1700 uses 128GB of memory and includes a 500GB HDD, can be controlled remotely and can be protected from cyber threats with HP Jet Advantage Security Manager. The Adobe PDF driver on the HP T1700 means your computer is freed up even after sending very complex files to print, so time-consuming computer freeze-ups are minimised. Its dual roll option means that there is double the capacity and the ability to switch paper types quickly, since it reduces roll changes, so there are fewer interruptions to the workflow. In addition, even complicated pieces of work are handled easily, with its impressive processing architecture, 128GB memory and 500GB HDD, at 116 1/D pages per hour. The printer data is displayed accurately, as the high-density print heads enable 0.1% line accuracy with their 2,400 nozzles per inch. The investment in this printer needs to be considered alongside the running costs of using the new HP Bright Office inks.